The International District Community Garden is open, and has had hundreds of schoolchildren, volunteers, and families from the Southeast Heights neighborhood working in the garden and taking home fresh vegetables. Project Feed the Hood started a community garden in this area because of its low availability to nutritious, local, affordable food. 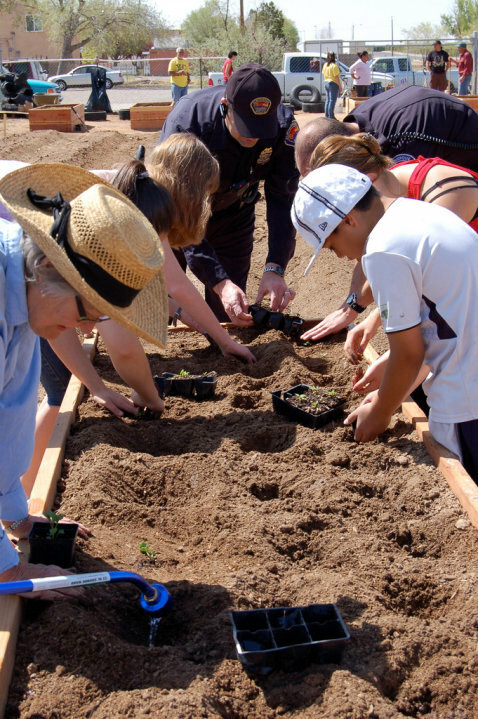 We have added a “backyard food” project on Albuquerque’s west side, in the Westgate neighborhood. We are also working with local schools to implement gardens there that will be able to provide fresh, healthy food to students during mealtimes while improving student health. 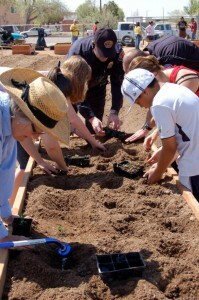 There are also workshops held Saturday mornings at the International District Community Garden, where people can learn gardening techniques to use at home. Check the Events page to see the schedule of Workshops for Spring 2012. Check the blog often for opportunities to engage in Project Feed the Hood, and fill out the Volunteer form if you are interested in volunteering with us. If you have questions about how to grow food, or are having a particular problem in your garden, ask Joaquin for advice. He’ll post his answers bi-weekly here on our website.